How can I find out a list of available $string values for user_access() function? As long as every module can define their own permissions, there is not a "strict" list of those string. You will need to "construct" it if you really need to have such a list programmatically. As @Berdir said, the easiest way to see which permissions are available is to go to the permissions admin/people/permissions in Drupal 7. Step one. Go to admin/people/permissions find the permission you would like to use and right click on a check box to the right of the permission you would like to use. Select 'Inspect Element' or just go look at the source. // List only the modules that have permissions. You can use user_permission_get_modules() function, which returns an array of all defined permissions and their modules. An associative array in the format $permission => $module. The easiest way is to check the permission page (D7: admin/people/permissions, D6: admin/user/permissions). 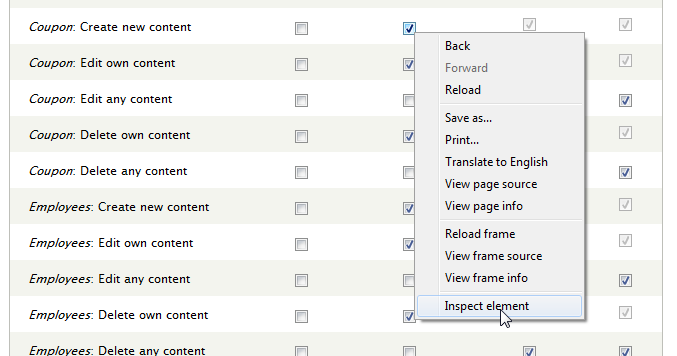 Note that you directly use the displayed string in Drupal 6, for 7 you need to have a look at the checkbox name/value. This is because permissions now have a translated title and description in Drupal 7. So if you want the name for the permission "View published content" in Drupal 7, the value is "access content" which is your permission name. If you know which module the permission is coming from, you can also check the corresponding hook_perm() (D6) / hook_pemission() (D7) implementation of that module. In many cases, you want to define your own pemissions and use these, you can do that with the above hooks. After installing and enabling the Devel module, navigate to admin/config/development/devel . There is a setting titled, "Display machine names of permissions and modules". Be sure that is checked. Now on the permissions page at people/permissions, hover over the name of the permission you are questioning. It may delay a second or two, but then the string value will show. Here is a simple form alter that will add the permission key to the name on the permissions page. That should make it easier to look it up. You will need to add it to a custom module and replace "mymodule" with the name of that module. It basically outputs the machine name, taken from the first checkbox on that name, on to the first cell, under the label. The script relies on jQuery, which shouldn't be a problem on Drupal 7. I typically paste it on the Developer Tools console and run it from there. I might create a bookmarklet for it in future. // Get the first checkbox in the row. // Get the first cell, containing the permission label. // Embed the permission maching name on permission label cell. In D7, Where can you go to get a list of Access Arguments to be used with user_access()? How to specify a permission as an access argument? Where can I get permission string to use with user_access? How to programmatically update the allowed values of a list field? As an admin, how can I view individual user permissions for individual nodes?